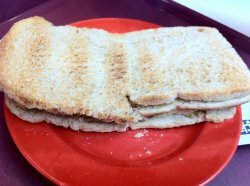 Went to Ya Kun for tea today and sadly,the kaya toast with butter was really pathetic. The amount of kaya inside was extremely little,unlike the other outlets that I've been to.And the thick slice of butter didn't melt at all as the bread was not hot. A very disappointing tea break I would say.